Designed by William Morris, “The Holy Grail” is actually known as “The Arming and Departure of the Knights”. W.K. D’Arcy, commissioned it for his dining room in Stanmore Hall. “The Holy Grail” is based on Sir Thomas Malory's poem, “Le Morte d’ Arthur. In “The Holy Grail”, we see the Knights of the Round Table preparing for their immortal quest to find the Holy Grail. Sir Lancelot can be seen on the far left, receiving his shield from the lovely Guinevere. 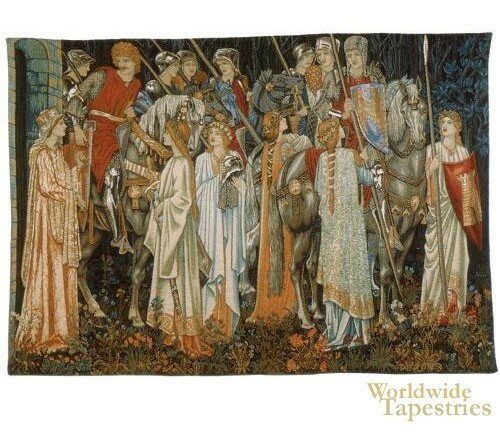 This beautiful tapestry based faithfully on the original works is representative of the fine work Morris & Co. was renowned for creating between 1895 and 1896. The original of this tapestry hangs in the Birmingham Museum in England. This tapestry is lined and comes with a tunnel for easy hanging. Dimensions: W 36" x H 25"
Dimensions: W 72" x H 51"